(NaturalNews) When a group of uniformed men wearing guns sets up a road block then ask you to "volunteer" a DNA sample and blood sample, it stretches the definition of "volunteer." But that's what happened in Alabama yesterday as off-duty cops in two counties set up DNA collection roadblocks and stopped cars to ask if drivers wanted to "volunteer" DNA swabs and blood samples. It was all part of a study being conducted by the Pacific Institute for Research and Evaluation, which is probably studying what percentage of the sheeple population will allow the government to swipe their DNA and archive it in a database for a measly ten bucks. According to a story published in the Daily Caller, "drivers were asked to voluntarily offer samples of their saliva and blood." Just one county in Alabama had set up five roadblocks in one day, and more are being rolled out nationwide. The explanation behind all this is that it's for a "medical study" to see how much alcohol drivers have in their blood. If this is a "medical" study, then why not have scientists in lab coats stopping cars to collect blood? So here's the real problem with all this: when police carrying guns walk up to your car at a roadblock and ask if you will "volunteer" some samples of your blood and DNA, that's more than a bit coercive. If this is truly supposed to be a scientific study of the blood alcohol levels of anonymous drivers, then why not have scientists in lab coats on the streets collecting the blood? Answer: Because no one would give it to them. The police are there to make sure the "volunteer requests" are backed up by the implied threat of force. A roadblock staffed by men with guns is going to get a lot more "compliance" than a roadside volunteer booth staffed by a bunch of lab geeks. And that's why this little police state experiment is a gross abuse of police power and a violation of the civil rights of those targeted in the study. Besides, since when did scientists have to use police to collect data for their studies, anyway? If the real purpose of the roadblocks is to collect blood samples for a study documenting alcohol levels of random drivers -- as it claimed by the study organizers -- then they need to go back to school and learn about scientific methods. Because all you're going to get in this study is a self-selected sample of blood and DNA from the most timid, easy-to-dominate sheeple of society... or people who live on such low incomes that $10 seems to be fair compensation for allowing the government to swipe their DNA and archive it in a database. In other words, you're going to end up studying the blood and DNA of society's total morons and dumbed-down sheeple, many of whom are physiological anomalies to begin with because they all have no spine, no guts and no balls, either. Thus, the entire stated purpose of the study is hogwash. There is no scientific validity to any data set of human DNA generated from roadblocks staffed by police. The study is invalid at the outset because, by design, it fails to test the blood of those who prefer NOT to interact with police -- i.e. people who have probably been drinking. This is why I don't believe for a minute that this is some sort of public safety study. It's far more likely to be a police state test run just to see how many idiots in American society will let some government goon swab their DNA when commanded to do so. And that number is shockingly high. We now live in the United States of Apathy, where the sheeple are far more interested in their late-night television, Happy Meals and on-screen celebrities than protecting their rights from an ever-expanding surveillance police state. 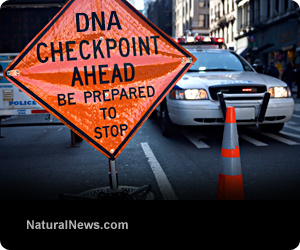 • At a police DNA swab checkpoint, you're supposed to open your mouth. But at a TSA checkpoint if you open your mouth, you're detained as a possible terrorist. • At the TSA checkpoint, though, you're supposed to remove your belt and drop your pants. But at a police DNA checkpoint, if you drop your pants, you're arrested for indecent exposure. • In America, a "terrorist" is a citizen who forgets at which checkpoint he's supposed to drop his pants vs. open his mouth. And if all this talk about pants dropping and mouths opening gets you excited, Janet Napolitano has a job waiting for you at DHS.